You can thank his mom’s cousin Betts who encouraged Tony to go to barber school all those years ago. Without his “profound influence”, Tony might not be barbering today. Tony moved his shop within the shopping center one time to its current location at 637-M South Broadway. “We have a spectacular view of the mountains, our location serves all of South Boulder,” Tony says. Multiple generations of the same family seek Tony out for a cut or a shave for the most important moments in their lives. He finds his work very rewarding. He loves the interaction with clientele and the service he provides. And so do the customers. 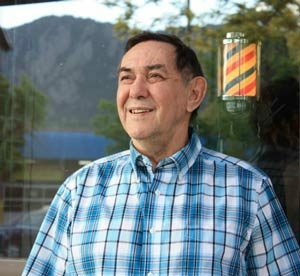 Tony has clients who are still with him since his first job at Crossroads Barber Shop in 1966. Clients who live out of state always stop by Table Mesa Barbers to get a haircut when they are in town. One of Tony’s favorite memories is of a young man who had been a long-time client. One day he came in for a cut and told Tony it was his wedding haircut. The client got his usual trim. After the wedding the client’s new bride told Tony people at the wedding thought her new husband’s cut must have cost about $150. “That’s a running joke to this day,” Tony says. In 2010, Tony celebrated 50 years of barbering! “I would like to take a moment to thank every customer for their loyalty and business.” Need a cut? Tony will take care of you. Full Service Barber shop serving Men, Woman and children of all ages. We have barbers and stylists available for all haircut styles.